AW batteries are well known for being the best of the best. These high performance rechargeable batteries will supercharge your vaporizer! You simply can't get a better battery than an AW. Although the rating is lower than the other batteries we offer (750 versus 900 mAH) these AW's are actually much stronger batteries. AW Batteries are equipped with an Anti-Explosion Vent. This new feature provides an added layer of protection against gas build-up, in addition to the standard PTC thermal protection. Unlike regular vents used by most Li-Ion cells, these new modules will actively stop the action by separating the electrodes inside the battery when the pressure reaches a preset threshold. The vent disc will open and release the gas thereby stopping the cell from further chemical reaction (and possible explosion). Combined with the PCB electronic protection and two layers of mechanical (thermal and pressure) protection, these new protected cells are one of the first with added safety features in place. Tell us what you think about AW li-ion 14500 High Performance Battery, share your opinion with other people. 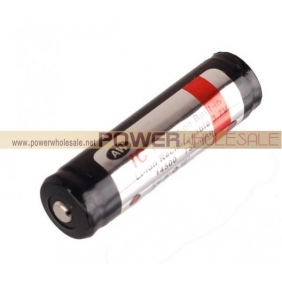 Please make sure that your review focus on AW li-ion 14500 High Performance Battery. All the reviews are moderated and will be reviewed within two business days. Inappropriate reviews will not be posted.